Never be caught short again without the adapters, cables and interfaces you need for your next presentation with Comprehensive's Connectivity Kits! 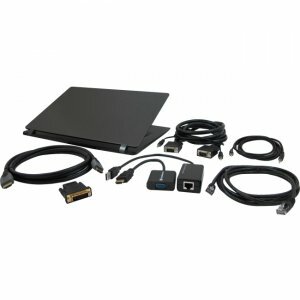 Comprehensive's Universal Conference Room Computer Connectivity Kit allows you to connect your computer to any HDMI/DVI/VGA external monitor. Comprehensive's kit also allows you to connect to your network through a high speed ethernet adapter. The kit includes an HDMI to VGA and HDMI to DVI adapter, which lets you connect any HDMI compatible computer to a HDMI/DVI/VGA external monitor via HDMI. Also included in this kit is a USB to ethernet adapter with Cat5e cable, which adds wired network support. This connectivity kit is perfect for traveling between meetings, conferences, offices, and anywhere in between. All components are RoHS Compliant and come with Comprehensive's Lifetime Warranty.